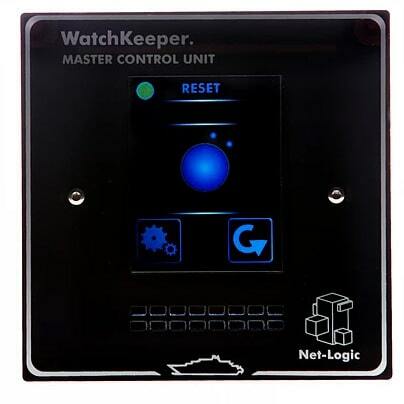 The WatchKeeper+ is a Bridge Navigation Watch Alarm Systems (BNWAS) and is Type Approved by the MCA and meets the requirements of IEC 62616. It conforms to performance standards set by the MSC.128(75). WatchKeeper+ allows the ship operator to avoid extensive new cabling associated with traditional wired BNWAS by making use of a highly fault tolerant radio frequency mesh network, controlling information flow around the vessel. Cabling is minimised and vessel disruption and downtime is drastically reduced. A BNWAS is a dead man’s alarm system with the purpose of ensuring the officer on watch is alert and competent to carry out his duties. It is, in effect, a timer which counts down and alerts other navigation personnel if it is not re-set within a certain time period. The timer counts down a preset period, usually 12 minutes and when approaching the end of this period generates a visual warning on the bridge to reset the timer by pressing a button. If this warning is not acknowledged the system then triggers an audible alarm on the bridge (referred to as the First Stage alarm). If this alarm is also not acknowledged then the system will generate audible & visual alarms in the Captain’s cabin and/or the designated back-up Navigation Officer’s cabin (Second Stage alarm) to indicate that they need to go to the bridge. If the alarm is still not acknowledged then further alarms are raised in the crew’s mess and other shared recreational areas (Third Stage alarm).